Users of MailChimp and Capsule can now engage visitors through ClickDesk’s offerings. ClickDesk, a leading provider of Multi-channel online engagement technologies to small and medium businesses, today announced integrations with MailChimp and Capsule CRM – two major players in their respective industries. The integration with Capsule will enable businesses to receive live chats and VoIP calls directly to their operator’s IM (GTalk and Skype) – which can be updated in Capsule CRM instantly. 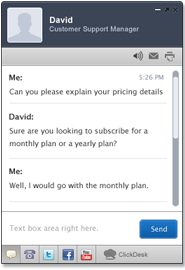 The live chat software integration with MailChimp will allow operators to add contacts instantly from their IM (GTalk/Skype) to the direct mail subscribers list, and also subscribe or unsubscribe a visitor while chatting directly in Google talk or Skype. “Having built a client base and secured the trust of over 25,000 businesses in less than a year, ClickDesk is now looking to expand by partnering with two marquee players. We are excited to be working with MailChimp and Capsule to take multi-channel engagement to the next level,” says Manohar Chapalamadugu, CEO of ClickDesk. MailChimp has swiftly emerged as the leader in email marketing and newsletter delivery. By integrating with ClickDesk’s cutting edge communication technology, website owners will more effectively be able to interact with their visitors. What’s more, subscriber details, such as name, email and location will automatically visible to the live chat operators, right from the IM screen. Capsule is an online hosted CRM system for small businesses and sales teams looking for a nimble, affordable solution to manage relationships from a single interface. With Capsule live chat integration, ClickDesk will automatically pull up contact information of leads on IM if they initiate a chat from the website. ClickDesk’s functionality will also allow for adding new contacts, notes and post-chat transcripts to the CRM account directly from the chat interface. ClickDesk offers a free forever plan, and paid plans start at $9.99. To learn more, please visit http://www.clickdesk.com. ClickDesk is the first social live chat service to integrate social communications, voice support and help desk into a live chat service. The service is 100% cloud based, which eliminates the need for business owners to install any additional hardware or software. ClickDesk is headquartered in Sunnyvale with offices in Hyderabad.